50% luck, 50% skills. This is a great intelligame for iPod-touch, iPhone, and iPad! This great App is aviable at App Store! 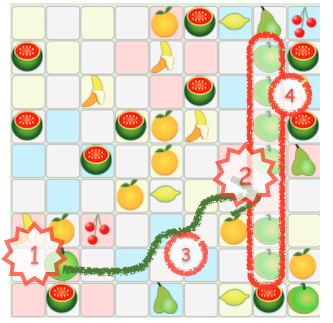 In this game you move fruits on a game board. 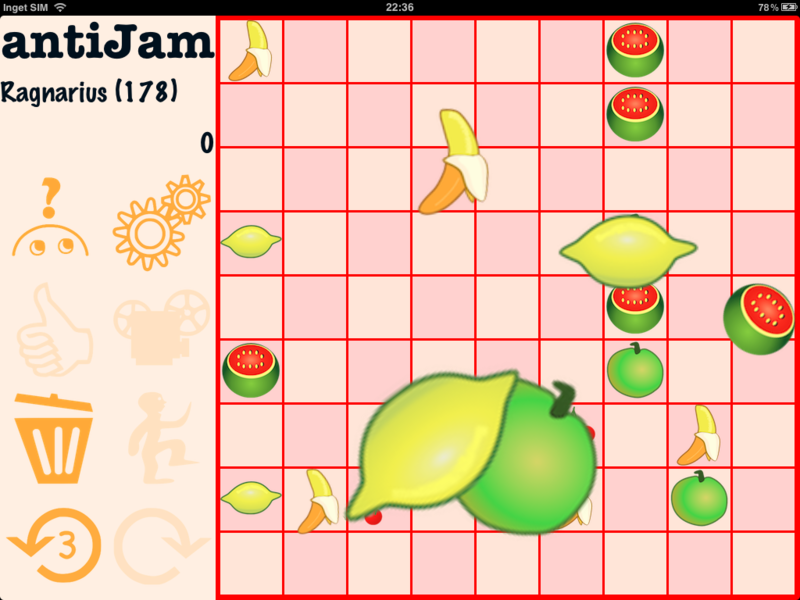 After each move, more fruits drop down. 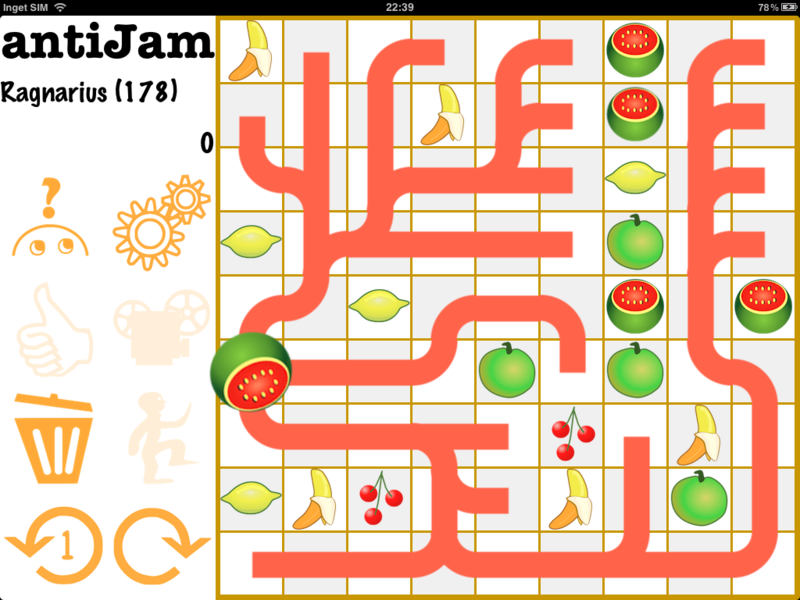 The board will therefore gradually become more jammed, making it harder to move fruits, unless you can get rid of them. Line up 5 identical fruits to erase them and score points! Skilled players can play for a long time before the board finally gets completely jammed. The picture below illustrates many aspects of the game. 1 You touch an apple. 2 You touch an empty spot. 3 The apple moves to that spot. 4 More that 5 apples in a row, hence they will be erased! 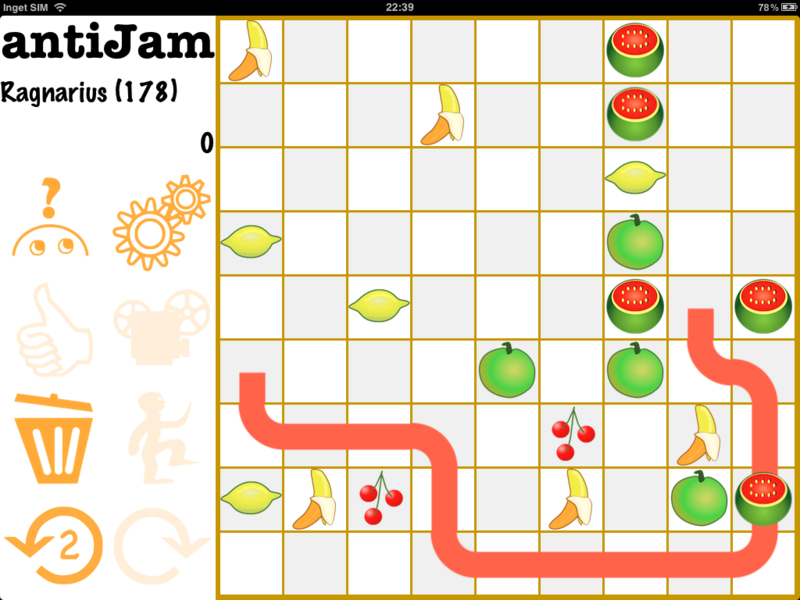 Let us look at some screenshots..
next, I move the fruit..
the plan is of cource to line up 5 melons, now I get 3. When you play, you will hear a rewarding applause, whenever you deserve it. The more fruits you erase, the more intense the applause. If you have played a very good game, you may like to show it to somebody, brag a litte bit. This can be done! Your very best game has been captured, stored, move by move. You can replay it anytime. Just touch the projector button. Please, e-mail your questions or suggestions to: Your opinion is very important to us! If you like our game, please give us a good rating at appstore! (or here). Good ratings are crucial to a small developer team like croobie.